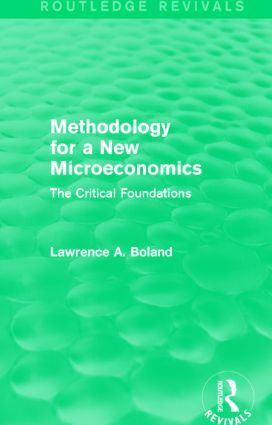 First published in 1986, this title argues that the successful development of a new microeconomics requires a deeper understanding of methodological individualism and its role in stability analysis. Lawrence Boland expounds a critique of neoclassical models, which, he contends, often fail to include an explicit stability analysis. He demonstrates that much of the sophisticated theoretical literature over the past thirty years can be understood as ad hoc attempts to overcome the deficiencies of such models in the absence of cogent stability analyses. In conclusion, he explains the need to update the theory taught at universities, and to develop a truly individualist version of microeconomics that is consistent with the methodological principles of major neoclassical models. An important contribution to economic methodology, this work is a highly valuable resource for all students and teachers of economics at the undergraduate level.